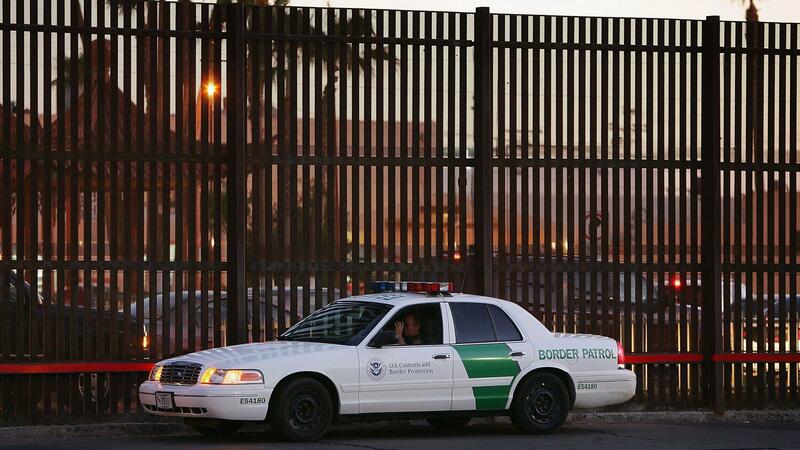 A U.S. Customs and Border Protection car parks next to the U.S.-Mexico border fence in Calexico, Calif., in 2006. President Trump's "zero tolerance" practice of 100 percent prosecution was modeled after an earlier get-tough policy on the Southwest border called Operation Streamline. It was supposed to streamline the process for punishing unauthorized immigrants and deter people from jumping the border. Streamline began in December 2005 as a pilot program in the sleepy border town of Del Rio, Texas. The Border Patrol was frustrated then — as now — by the impunity of undocumented border crossers. So it began referring every first-time crosser for prosecution. Prior to that, the immigrants had been allowed to return to Mexico without criminal charges, a procedure called voluntary departure. If Streamline was supposed to deliver consequences to unauthorized crossers, it also bogged down the courts. Today, nearly 60 percent of all prosecutions for all federal crimes in the nation are for immigration violations, according to the TRAC project at Syracuse University. "Operation Streamline has been going on for a number of years and it doesn't seem to be deterring people from coming into the country," says Joseph Cordova, supervisory assistant federal public defender in Del Rio. The number of unauthorized crossers apprehended each month has soared to 50,000 for each of the past three months. "The deterrence of spending a little time in jail doesn't seem to be having an impact on them," he says. His observation is shared by federal Judge Alia Moses, who has been on the bench in Del Rio since the beginning of Operation Streamline, 13 years ago. "I've been down there when they have prosecuted, and I've been down there when they haven't. And it's the same, OK?" she says. "People come for economic reasons or they come because they have a reason to be in the United States." Moses says the program was initially successful, then it fell off as undocumented immigrants avoided Del Rio and crossed elsewhere. Under Presidents George W. Bush and Barack Obama, the program was expanded to other areas of the border in Texas and Arizona. "That's why they expanded it, because some of these people just stopped coming to the Del Rio Sector, and started going to, say, Laredo or Big Bend Sector or somewhere else," says Jon Anfinsen, president of the local Border Patrol union in Del Rio. While Streamline may have satisfied a hankering for border justice, no one can say whether it achieved lasting results. In 2015, the Inspector General of Homeland Security declared the program increased the workload for Border Patrol agents, yet the agency could not prove it had any effect on illegal border crossings. "There is no credible data indicating that prosecuting people for crossing the border is a deterrent," says Judy Greene, director of Justice Strategies, a pro-immigrant policy research group. In 2016, she co-authored a highly critical report on Streamline. It estimates that in the first 10 years of the program, incarceration costs alone topped $7 billion. Now President Trump has signed an order to end family separation, but the administration says it will continue its controversial "zero tolerance" practice. Border agents, judges and attorneys interviewed for this story agree this new emphasis on prosecuting illegal crossers requires even more resources than Washington is sending. There's a need for more judges, more lawyers, more court staff, more adult detention cells and more shelter space for children. "I can't imagine this is a good policy," says a senior official inside the U.S. District Court's Western District of Texas, who asked not to be identified. Under "zero tolerance," 70 children a day were being sent to federal shelters while their parents are prosecuted. In the first five weeks of the program, the number of children removed from their parents topped 2,300. Chris Carlin, supervisory federal public defender in Alpine, Texas, points out most of the prosecutions under "zero tolerance" are for one of the lowest crimes in the U.S. criminal code. "A petty misdemeanor is the federal equivalent of a parking ticket," Carlin says, "and the consequences of a parking ticket should not be that you lose your child." The Trump administration had insisted it had no choice: kids cannot accompany parents who are jailed by the Department of Justice. But under Streamline, the Border Patrol used discretion. As a rule, agents did not send parents to criminal court and break up families. "We didn't see them," says Judge Moses. "The Border Patrol was letting them go just through the immigration process and they weren't even coming into court." That discretion had consequences. Moses says word got back to Latin America that parents could travel with their kids and after they were caught the family unit would be processed and allowed to continue its journey into the U.S. Border agents say this practice, that they derisively call "catch and release," is what caused the recent surge of families illegally crossing the border. Moses adds, "This wave [of families crossing] we've been seeing in the last few years, at least in my judicial division. It's a very recent thing." She says some adult immigrants who appeared in her court brought children who do not belong to them in order to take advantage of "catch and release." Moses says she has no idea if family separation will be a deterrent to the current wave of illegal immigration. And for context on what we just heard from him, I want to bring in NPR's John Burnett, who has covered immigration policy for years. Hey, John. KELLY: So what Brandon Judd was saying there, that this separating of families typically only lasts a few hours and that the percentage of children who are separated for a longer amount of time he said is very small - based on your reporting, is that true? BURNETT: I think it depends on where you look. In the Rio Grande Valley in the southern tip of Texas - that's the nation's illegal crossing hotspot - I talked to a Border Patrol agent last week, and he agreed with Mr. Judd. He said most of the children are left alone in these chain-link holding cells we've seen for a matter of hours while their parents are in federal court. So typically they'll plead guilty to a misdemeanor, and they're sentenced for time served, and they're reunited with their kids. Then they can get an electronic ankle monitor and go to the Greyhound station in McAllen and continue their journey and hopefully show up in immigration court later. But we learned from Homeland Security just this morning that in the first 35 days of Trump's zero tolerance, more than 2,300 migrant kids were sent to these government-contracted youth shelters where they stay for nearly two months. That's because their parents were not released from federal custody. So it's not a small number of kids. KELLY: Twenty-three hundred - OK, what about the other point we heard him make? There's nothing new here. Nothing has changed since 2014. How did you hear that? BURNETT: Well, I think Judd is talking about an earlier zero tolerance program on the border called Operation Streamline. Trump's zero tolerance was actually modeled on this program, but there were far fewer adults and children separated under Streamline - in general, only if the adult was not the parent or if they were thought to be a threat to the child or maybe a convicted felon. As I understand it, now child separation is happening with much greater regularity than it did in Streamline. KELLY: Well, John, was Operation Streamline successful? What did we learn from it that might be applicable now? BURNETT: Well, I've done some reporting on that, and there's really scant evidence that it served as a deterrent to illegal crossings. KELLY: All right, let's hear the story. BURNETT: The program was supposed to streamline the process for punishing unauthorized immigrants to scare people into stop sneaking across the border. It was begun in late 2005 as a pilot program in the sleepy border town of Del Rio, Texas. The Border Patrol was frustrated then as now by the impunity of undocumented border crossers, so they began referring everybody they caught for prosecution. Today nearly 60 percent of all prosecutions for all federal crimes in the nation are for immigration violations according to Syracuse University. Has the strategy worked? JOSEPH CORDOVA: Operation Streamline has been going on for a number of years, and it doesn't seem to be deterring people from coming into the country. BURNETT: Joseph Cordova is a longtime federal public defender in the Del Rio office. He notes the number of unauthorized crossers apprehended has soared to 50,000 for each of the past three months. CORDOVA: The deterrence of spending a little bit of time in jail doesn't seem to be having an impact on them. BURNETT: His observation is shared by federal judge Alia Moses. She's been on the bench in Del Rio since the beginning of Operation Streamline 13 years ago. We met outside of a coffee shop in San Antonio. ALIA MOSES: I've been down there when they have prosecuted, and I've been down there when they haven't. And it's the same, OK? People come for economic reasons, or they come because they have a reason to be in the United States. BURNETT: Moses says the program was initially successful, then it fell off as undocumented immigrants avoided Del Rio. Under presidents Bush and Obama, the program was expanded to other areas of the border in Texas and Arizona. Jon Anfinsen is local president of the agents' union in Del Rio. JON ANFINSEN: So that's why they expanded it - because some of these people just stopped coming to the Del Rio sector and then went to, say, Laredo or Big Bend Sector or somewhere else. BURNETT: While Streamline may have satisfied a hankering for border justice, no one can say it achieved lasting results. In 2015, the inspector general of Homeland Security declared the program made more paperwork for Border Patrol agents, and there was no measurable proof it had any effect on illegal border crossings. JUDY GREENE: There is no credible data indicating that prosecuting people for crossing the border is a deterrent. BURNETT: Judy Greene is director of Justice Strategies, a pro-immigrant policy research group. In 2016, she co-authored a highly critical report on Streamline. It estimated the first 10 years of the program cost the federal government $7 billion for everything from more enforcement to detention costs. Now comes the Trump administration's zero tolerance. Border agents, judges and attorneys interviewed for this report agree this new emphasis on prosecuting illegal crossers requires even more resources than Washington is sending. There's a need for more judges, more lawyers, more court staff, more adult detention cells, more everything and now more shelter space for children. Under zero tolerance, 70 kids a day are being sent to federal shelters while their parents are prosecuted - this for one of the lowest-level crimes in the U.S. criminal code, says Chris Carlin, a federal public defender in Alpine, Texas. CHRIS CARLIN: A petty misdemeanor is the federal equivalent of a parking ticket. And the consequences of a parking ticket should not be that you lose your child. MOSES: We didn't see that. The Border Patrol was letting them go just through the immigration process, and they weren't even coming into court. BURNETT: So the Border Patrol was not recommending prosecution for those adults with children. BURNETT: That discretion had consequences. Moses says word got back to Latin America that parents could travel with their kids, and agents would, quote, "catch and release" them to await immigration court. And that's what caused the recent surge of families illegally crossing the border. When asked if she thinks family separation will be a deterrent, the judge said she has no idea. John Burnett, NPR News. (SOUNDBITE OF MANU DELAGO'S "BIGGER THAN HOME") Transcript provided by NPR, Copyright NPR.